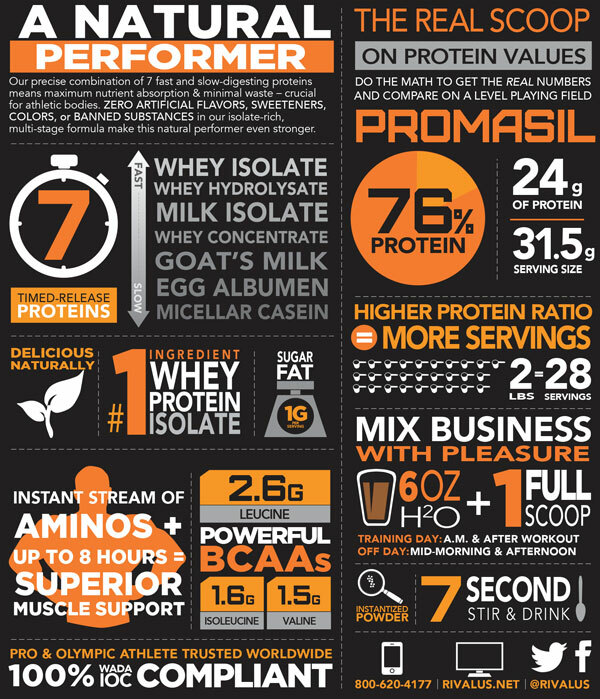 The most critical key to results is recovery, and the most essential element to recovery is protein. Vigorous training takes its toll on your body in the form of muscle tissue damage, and the best way to aid in the process of repairing that damage is to feed your body protein throughout the day in frequent intervals. PROMASIL helps by offering a 24g dose per serving of a 7-protein blend to strike the perfect balance between fast, medium and slow digesting proteins, and provide an excellent amino acid profile. Get the optimal recovery you need to be ready for game day with PROMASIL! Mix 1 scoop with 8 oz of cold water in the morning and 1 serving immediately after exercise on training days. On non-training days, take 1 scoop in the morning and one scoop in the afternoon. 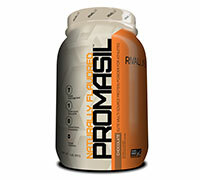 For best results, use PROMASIL everyday and combine with resistance training 3-5 days per week. NOTE: Nutritional information and ingredients may vary from flavour to flavour. Ingredients: Whey Protein Blend (Whey Protein Isolate, Whey Protein Concentrate, Whey Protein Hydrolysate), Promasil Sustained Action Protein Blend (Micellar Casein, Milk Protein Isolate, Egg Protein, Goat Milk Protein), Cocoa Powder (Processed with Alkali), Natural Flavors, Inulin, Salt, Stevia, Monk Fruit. CONTAINS MILK & SOY LECITHIN. (Soy Lecithin used as emulsifier). 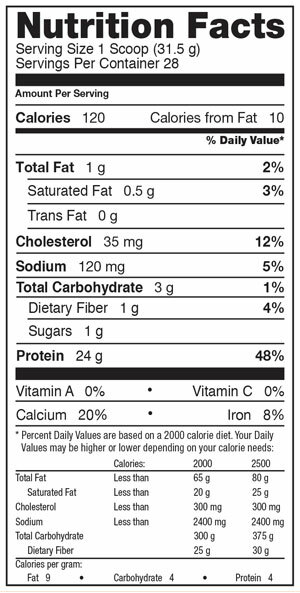 Manufactured on equipment that also processes products containing wheat, egg, peanut flavor & fish oil. Warning: Consult a physician before using if you are unaware of your current health status, if you have a medical condition, or if you or your family has a medical history of cardiovascular disease, diabetes, psychological disorders, hormonal abnormalities, or if you are taking any prescription drug. Do not exceed maximum daily dosage. Do not use if safety seal is broken. Contains ingredients derived from milk. Store in a cool, dry place. KEEP OUT OF REACH OF CHILDREN.